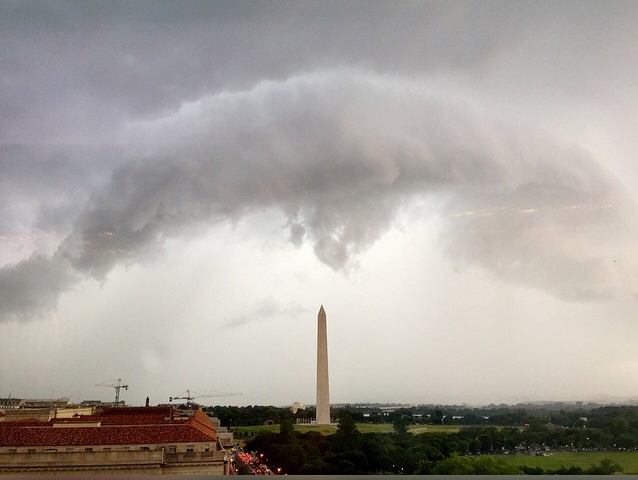 Clouds over the Monument. Photo by Grant Bez. 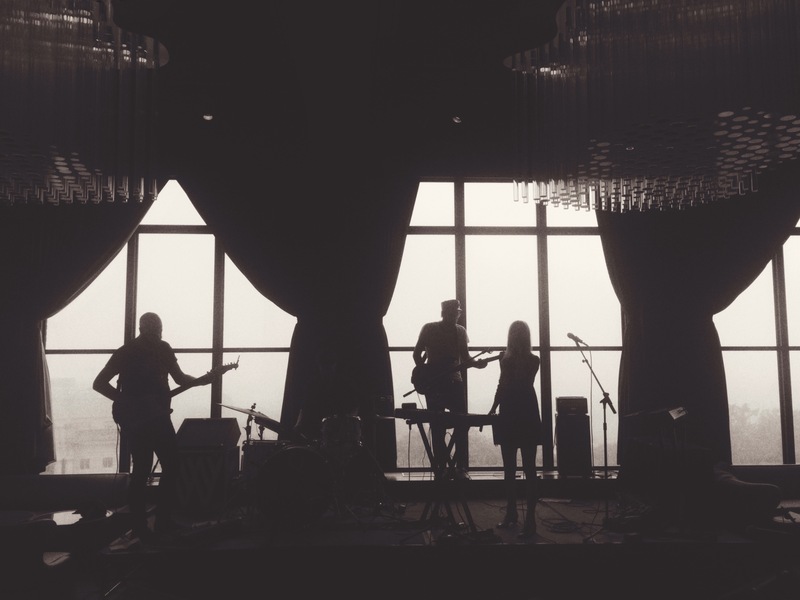 Thankfully, The Mynabirds are safely ensconced indoors, where Laura Burhenn (pianist/singer) and Grant Bez (tour manager/sound) have taken some pretty cool shots from the site of the evening’s show – the rooftop bar at the W. I missed the lightning display but manage to catch the last bit of soundcheck – musicians silhouetted against storm-grey skies. 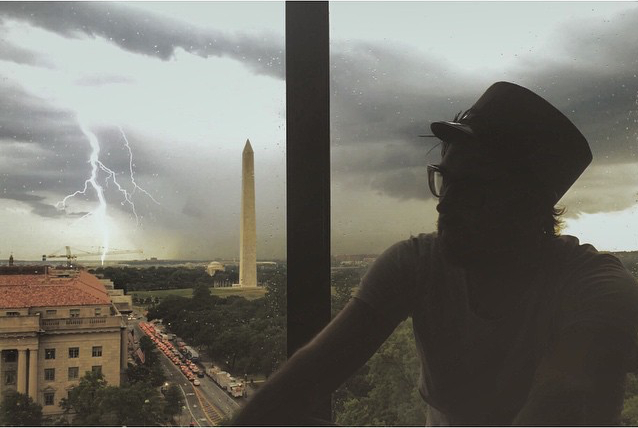 Lightning, Bradley. Photo by Laura Burhenn. As we draw closer to show time, the room fills. It’s a mix of long-time fans, curious hotel guests, and after-work happy hour attendees. Behind us, city lights glow ever more brightly against darkening skies. Then, 8:30pm. It’s time, again. 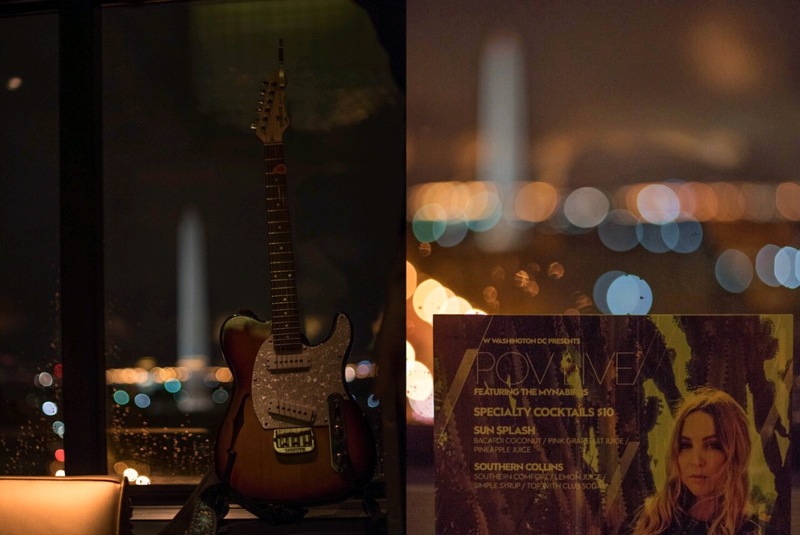 The rooftop bar feels as intimate as the 9:30 Club felt epic. Laura hops off the stage for a song, tambourine in hand, and the room is all smiles as the audience dances along. Songs like “Generals” and “Body of Work” take on a different patina with the Washington Monument in the backdrop, red lights in a metronomic throb: Haven’t I paid my dues yet? / Calling all my Generals / My Daughters / My Revolutionists … then, a nod to Sartre: Freedom is what you do with what / With what’s been done to you. 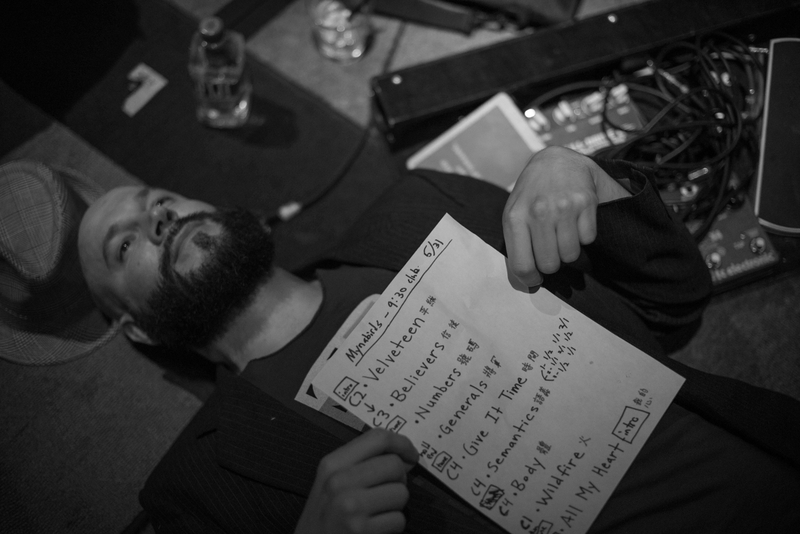 At the end of the evening, I ask guitarist J. Tom Hnatow for a photo of the set list. He shoots me a silly smile and stretches out on the stage. I think about hunting down chalk for an outline and crime scene photo, but settle for this shot: a freeze frame of a musician in temporary repose after two nights of music/motion blur, of birds in infinite flight. Lines of flight. The title for these posts came from the band name, of course, but also from the French phrase ligne de fuite, as used by Gilles Deleuze and Felix Guattari. Fuite translates as “flight” in English, but in the original, the word embraces the acts of eluding, flowing, and disappearing into the distance. Bird songs mark territory, but lines of flight can take us into the open, the outside, between earth and cosmos, betwixt night and day. Movement, change, multiplicities. In a rustle of wings, these creatures flit into and then soar out of the frame. I’m left with memories, echoes, and the hope of another encounter. 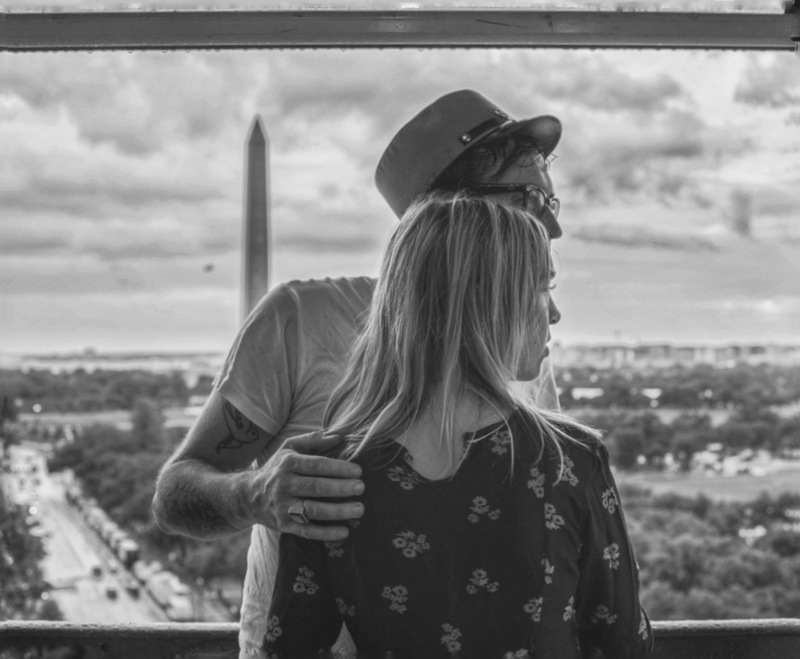 Pre-order The Mynabirds’ new album, Lovers Know, here. It comes out August 7 (Saddle Creek).